Successful leaders know that leadership is less often about having all the answers—and more often about asking the right questions. The challenge lies in being able to step back, reflect, and ask the key questions that are critical to your performance and your organization’s effectiveness. In What to Ask the Person in the Mirror, HBS professor and business leader Robert Kaplan presents a process for asking the big questions that will enable you to diagnose problems, change course if necessary, and advance your career. Great leaders don't have all the answers, according to Harvard Business School professor Robert Steven Kaplan. In fact, they can be as confused, discouraged and unsure of themselves and their decisions as the rest of us. The difference, Kaplan writes in his book What to Ask the Person in the Mirror, is that great leaders can take a step back and meet whatever challenges they face by asking the right questions. They formulate these questions in a way that helps frame the key issues at the heart of the challenge. Based on his extensive experience working with leaders around the world, Kaplan, the former vice-chairman of Goldman Sachs, has identified seven sets of questions that lie at the heart of leadership success in both business and non-profits. The first line of inquiry revolves around vision and priorities. Leaders must ask themselves if there is a clear and defining vision for the organization, as well as focused priorities for achieving that vision. Kaplan notes that a leadership group may not even realize that there are conflicting visions within the group that are creating unnecessary problems and challenges. Priorities and vision emerge again in the second set of Kaplan's questions for leaders, which is about time management. The first step is for leaders to assess how they spend their time — many leaders have not really given this question much thought. The second step is to evaluate whether the time spent matches the priorities of the organization. Many leaders, Kaplan writes, must learn to say "no." The third set of questions explores whether or not people, and just as importantly the leaders themselves, give and receive effective feedback. At the heart of this topic area, writes Kaplan, is coaching — not evaluation or mentoring, which are different. A year-end evaluation is a "verdict" — in Kaplan's phrase — that comes too late for the recipient to take any action in response. Effective feedback is specific, timely and actionable, he writes. The remaining sets of questions that leaders must ask themselves concern: succession planning and delegation; evaluation and alignment; the leaders as role models (dealing with communication and values); and reaching your potential. Is the design of your company still aligned with your vision and priorities? If you had to design the enterprise today with a clean sheet of paper, how would you change the people, key tasks, organization's structure, culture and your leadership style? Why haven't you made these changes? Have you pushed yourself and your organization to do this clean-sheet-of-paper exercise? Kaplan drills down into these questions, offering detailed suggestions on how to evaluate and change the organization. He finishes the chapter, as he does every chapter, with a set of specific, detailed "Suggested Follow-up Steps." These follow-up steps begin with identifying a key business unit to try out the clean-sheet-of-paper exercise. The exercise should be carried out by a group of leaders identified in the organization's succession plans, Kaplan writes. The group should be given a mandate to be candid and fearless in attacking sacred cows. This first follow-up step is followed by: agreeing on an appropriate time frame for the exercise; debriefing the group on the findings of the exercise; and developing a specific action plan for implementing some if not all the group's recommendations. 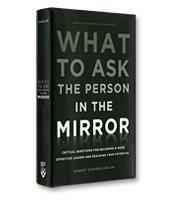 What to Ask the Person in the Mirror stands out from other leadership books because it is eminently actionable. There are no theories, no psychology and no stories involving world famous leaders of multi-billion dollar corporations. The frequent case studies — drawn from real life but anonymous — are short and pertinent illustrations of the author's points. This is a clearly written and organized toolbox that leaders will find immediately practical.